Isn't it weird the way things go. Today, the final day of March, was the warmest and sunniest of the holidays yet but was also the quietest. Having said that, the ratio of retail to tickets was good today! It's also twice this week Duffield have beaten Wirksworth on ticket sales. We can't be having that otherwise they'll be wanting a new office... oh wait, they are getting a lovely new office! The team were down there making some final adjustments ready for the fitters to come and start erecting it next week. No, in all seriousness it is great that customers are using both ends of the line to join us. Wirksworth is starting to look much better too as the picnic benches have now all been arranged with the parasols out. Picture attached. Down the yard, Dan and Derek continued to prepare the BSK for painting after the major bodywork repairs that have been done. Picture also attached. The DMU team fixed a few issues including a wiper motor control on 50170 and the second mans seat in the 119. The blue two car was also put together to give the 119 a break after 6 days of solid service. Painting continued on No.3 in the steam facility too. The PW team met at Shottle to continue their quest of fishplate greasing and spot resleepering. I woke up in the night wondering whether I had confused in "ejector" with my "injector" but as nobody had made comment, or had no interest, I will try not to have a disturbed night tonight. Today saw a three round trip service which was quite well supported and I am grateful to the train crew, Booking Halls at Wirksworth and Duffield, the Pullman Buffet Car and the EVRA Shop for entertaining today's visitors. The Gents toilet at Wirksworth received some sealant to try and resolve a long term problem with leaks and there was an LMSCA presence to move on the renovation of their Mark 1 BSK which is a vital part of this year's Tuesday Afternoon Tea Trains. There was also a lone dmu maintenance engineer who also prepared today's service train ensuring all went well. The PWT applied their dark art to the loose crossing nose on the Wash Green crossover and their activities are illustrated. The rest of the team continued with resleepering between Hazelwood and Duffield. It is of tremendous credit to them that some 320 sleepers have been replaced on our worst section. When you think that each sleeper, sourced from a supplier as preowned, represents some £18 of investment to be supported by new ballast at some £20 a tonne you can see where our funds go to keep the show, literally, on the road. A delightful photo of Rod found by Tony Watt shows him in one of the roles he enjoyed most. 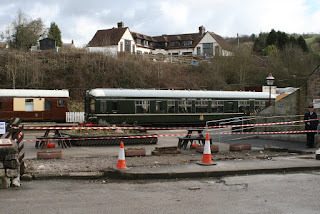 The other photo is of the Permanent Way Bubble Car that is making steady progress with bodywork repairs. What a difference a day makes as, whilst the weather was still cold, the sun tried to join us and passengers turned up to travel which warmed our cockles. The numbers were aided by a coach party that travelled from Duffield to Wirksworth followed by luncheon in the Pullman. A brief early crisis with the rostered driver falling ill was quickly resolved by Rob taking the first trip followed by Graham turning in to cover the remaining three and my thanks go to them for stepping into the breach. In addition to the train crew the Booking Halls at Wirksworth and Duffield together with the EVRA Shop and Model Railway Exhibition were all open to look after our visitors. It was good to see Mike Ball in action steadily refurbishing our LMS Brakevan that is having increasing use with the steam locomotives. 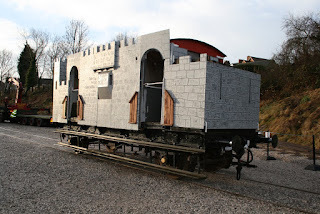 Henry Ellison received attention following his four day stint over Easter and Cathryn had attention to her new bunker and fitment of footplate steps. Stuart was active in the machine shop making a device to aid with the renovation of one of Cathryn's ejectors. 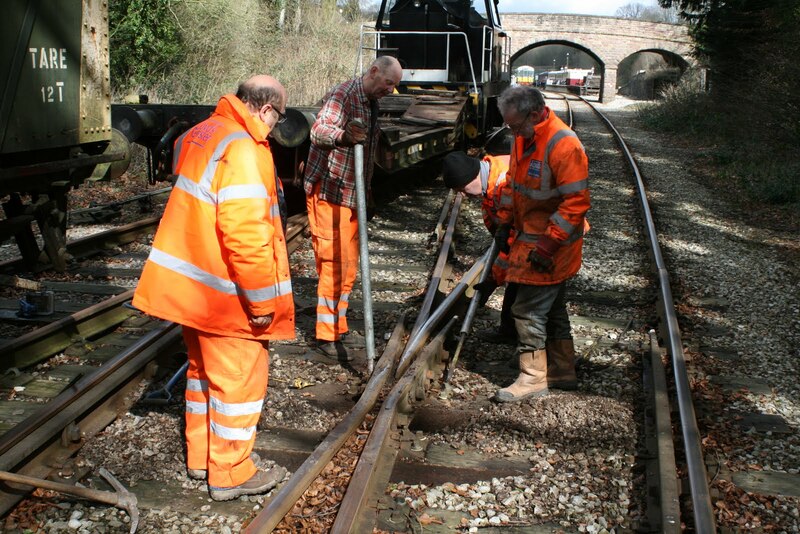 The two man dmu team tended to restoring the fleet to normality after the weekend. 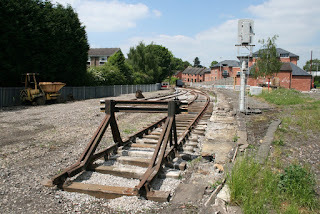 The Permanent Way team concentrated on Idridgehay's level crossing gates and resleepering between Hazelwood and Duffield. We were told of yet another sad event that occurred last night with the sudden death of Mark Civil at the very young age of 51. Mark was most helpful when we started steam operations providing advice and guidance to help our team form. Our sincere condolences go out to his family. and the Model Railway seemed to be used to keep dry also. the railway running. I know many of you have worked all four days. When I got up this morning it was gently snowing and I thought the gods had not looked favourably on our Easter offerings in spite of all the planning that went into providing a little extra for the anticipated child visitors. The show as ready as illustrated and I also show the nice new sign for the wheel tappers exhibit. As a contrast to the shining examples of heritage railway steam locomotives this short film shows what they looked like in real life! Just when you don't want to do it the wrong image was attached to my comments about Rod Birch. Hopefully here is a photo of one of his wonderful and inventive creations. On a lighter note, with the help of Fireman Peter Edgington and the assistance of Driver Ball and Guard Woodhouse, a different view of Henry Ellison climbing gently to Ravenstor is attached. It is tremendous sadness I have to report the death of Rod Birch last Wednesday. In our new life at Wirksworth I realised that when I was working on the 4th floor of South Western House for Sealink, the former South Western Hotel of the London & South Western Railway at Southampton Terminus Station, Rod was working round the corner supplying uniforms to the Merchant Navy visiting the many shipping lines that served Southampton. 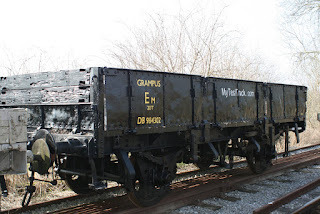 In the Wirksworth phase for both of us he got involved in the early Santa train events creating masterpieces from a brake van that was berthed at Ravenstor, one of which is shown. Not only that, he and his wife Mary provided inventive entertainment for our early Santa guests. Rod and Mary were a great team on the narrow gauge railway and he had a passion for the restoration of the steam locomotive fleet. The lasting memory is of his unlimited cheerfulness and willingness to help out on any project thrown at him. Our thoughts go out to Mary and son Graham. He will not be forgotten. A cold wind and squally showers put people off a little today with numbers being slightly down on yesterday, although still not too bad. Party Workshops Family Circus was in action and enjoyed by many although the bouncy castle was less popular, being covered in water for most of the day. Thanks to Pat who sat manning the Easter Egg Hunt too. The Pullman had another strong day with a shortage of Hot Cross Buns declared. The DMU team spent the day changing the injectors on both of 50253's engines. This certainly improves the tickover of No.2 engine! 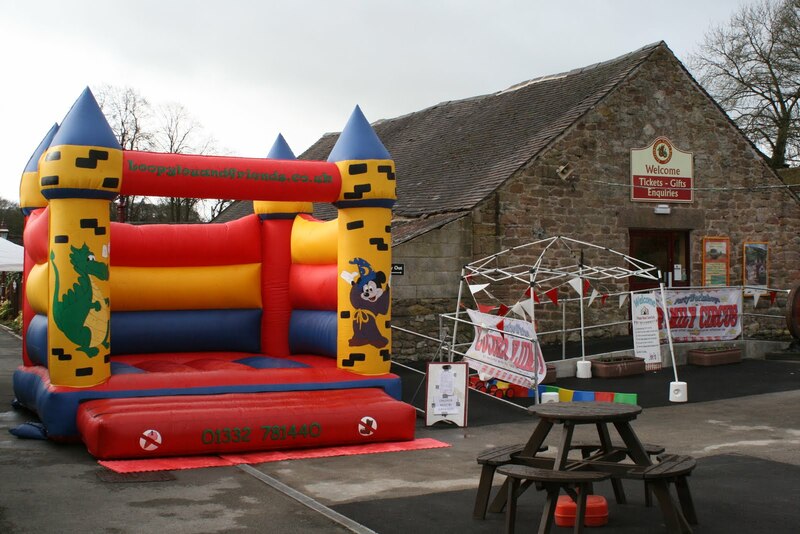 The weather forecast seems to be improved for tomorrow with most of the rain expected in the middle of the night, so fingers crossed for a nice(ish) day because the Family Circus etc are still at Wirksworth for you to enjoy! Typical bank holiday weather descended upon the metropolis of Wirksworth today but surprisingly we still had a pleasant number of families who came along to partake in our Easter festivities. The Circus and Easter Egg hunt proved very popular with both young and old. Earlier in the day the steam team played host to a local VIP footplate experience and went on to provide the scheduled steam service to Ravenstor. Today's Wirksworth to Duffield service was supported by the EVRA shop, Pullman Buffet, narrow, miniature and model railways. Down the yard the three DMU musketeers undertook a complex shunt to assist the LMSCA and a small number of volunteers continued their work on the Duke. Grateful thanks go to every one who gave up their bank holiday time to ensure the railway was able to provide a good range of activities for our visitors to enjoy despite the weather. Todays picture shows just that. A gloriously sunny day brought out quite a few passengers on the prelude to our main event this weekend. The Circus is in town from Saturday and even though there looks to be rain around, it doesn't look quite as bad as initially thought. It was pleasing to see visitors using our new circulating area created just Thursday. Back to Friday and the place was awash with volunteers, many thinking it was Saturday. The PW Bubble had four more steel patches welded in and surface rust removed. It also had the engine that was underneath it removed to even the weight and also to see what condition it is in. Further work continued on the BSK with the odd window frame coming past, whilst team Duke were also in. Work also progressed on the Miniature Railway. The weather turned just in time for Easter although we might get a nice day tomorrow. Don't let the damp weather put you off sampling the activities over the weekend though! 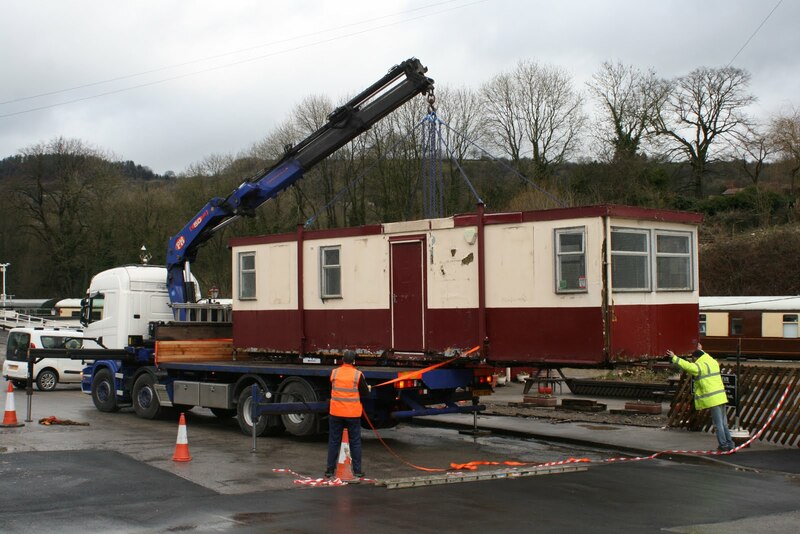 First thing this morning the new Duffield Booking Office came on an articulated lorry from Holland which has been procured by a firm near Hazelwood. Strange how things are. Anyway, it was a funky lorry with a forklift hitch hiking on the back which was quite cool and it also meant that it took about 5 minutes to put onto the Sturgeon before the driver sampled an English coffee and got on his way. 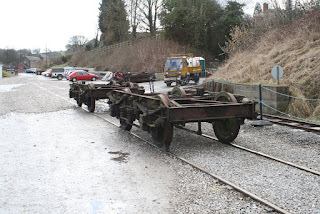 Then the maintenance team pulled the wagon out of the car park and proceeded to fuel and prepare the trains for the weekend. Photo to illustrate attached. 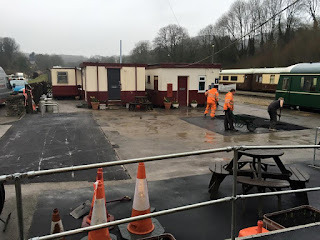 This afternoon the platform tarmac men came and set about making good the two patches where the former Booking Office cabin sat and the old garden area. It is good to have these done by Easter, even if the edging fence isn't. A work in progress photo was snapped before it actually went dark! Some work was carried out on the Miniature Railway this afternoon as well as the BSK in the shed. Finally some sun again! This brought about a flurry of passengers and a large number of people on motorbikes to keep the Catering Dept entertained. 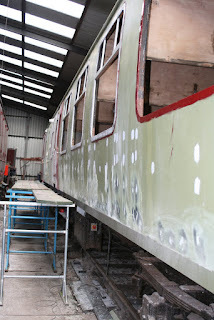 Down the yard, Dan filled and primed some more of the BSKs body side ready for the repaint. The DMU team were quite strong today and used the nice weather to attack the P Way Bubble. Some new metal was welded in on a particularly bad part of the body but there's still a fair few more of these patches to do. Today's piccies are a before and after. 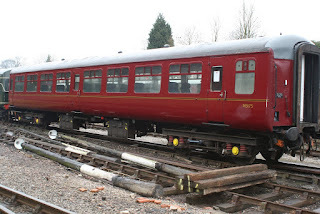 At the south end, the previously cleaned up and primed aluminium cab window frames were reinstalled whilst the ugly brackets from the rescue train days at the north end were cut off. The chill factor in the wind obviously reduced our passenger numbers but it was a profitable day and was supported by the Model Railway and Pullman Buffet plus the EVRA shop. The DMU group changed a leaking radiator on MET Camm 50253 and Bubble car 55006 had all its 26 seat backs fitted. A stark contrast to last Friday when it was fairly warm, sunny and there was anticipation and excitement for the upcoming event weekend. Today you could see the tumbleweed blowing at Wirksworth. There was activity on the BSK with the window frames being prepared for reinstallation. In the steam facility, Joe and Nathan were working on the repaint of No.3 but I think the cold wind was hindering progress somewhat. Great progress at Duffield though, as you will have already seen from Chris. The concrete base is now laid ready to receive the Booking Office after Easter. Bookings are now being taken for our popular professionally-acted Murder Mystery evening. Details and booking at www.e-v-r.com/murdermystery . I suppose there has to be a quiet day every so often! 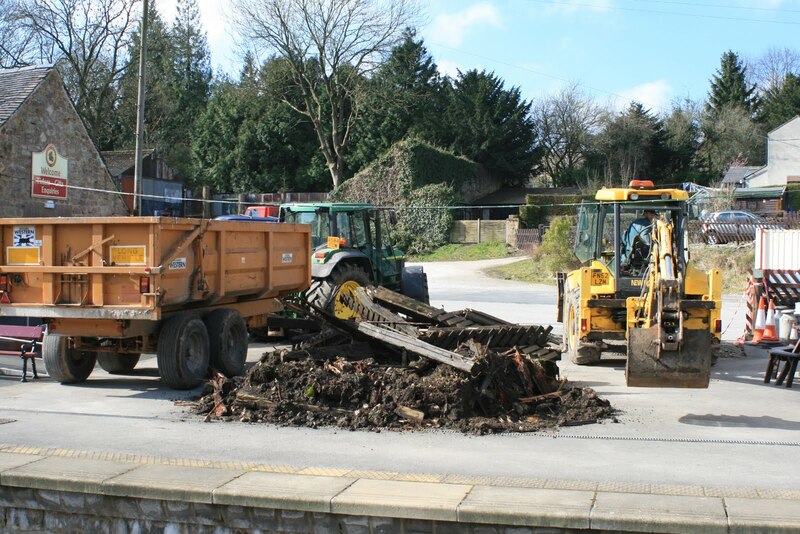 With all the splendid work being achieved at Duffield here is a reminder of the scene a few years ago. 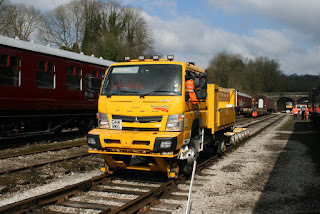 The other photo is of the Network Rail vehicle "Trunky" hauling the test trailers on Wednesday. A lovely sunny day which saw the faulty dynamo on Iris removed and also some movements around the yard in preparation for the weeks ahead. At Duffield, the concrete for the base was in full flow as progress there continues apace. Then if we come slightly further north the PW team were in rapid sleeper change mode near Hazelwood. Further north still, at Idridgehay, was both a group of volunteers treating the platform fence and also the S&T dept with the Infrastructure Manager hanging the new level crossing gates. These still need some work but they are now operational again. Today's photo shows what a nice day it was. 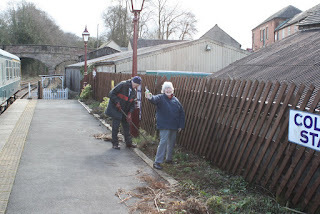 Another "end of an era" event as the Wirksworth raised garden bed was removed to enlarge the circulation area at the Station and produce a space where events can be staged. The garden was created in 2003 as a measure to save on tarmac as we just couldn't afford to surface the whole area. All plants have been safely recovered and the memorial sleeper will be relocated. 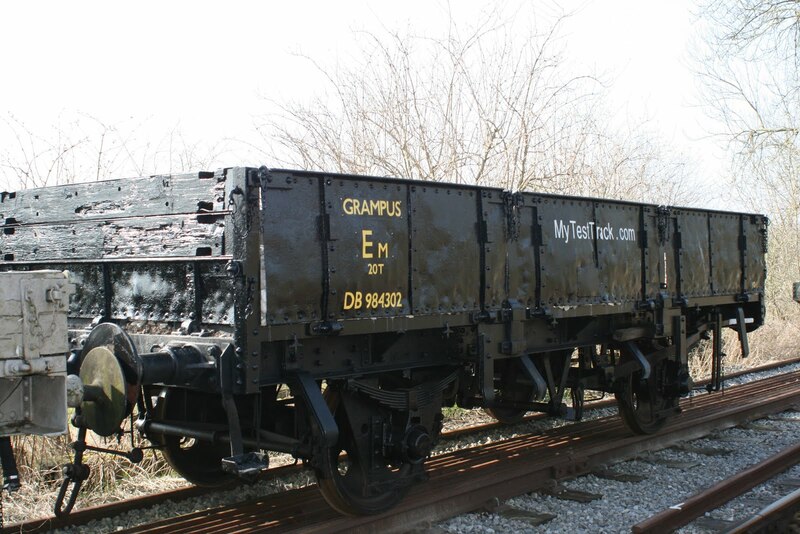 The second photo is of the Grampus wagon which benefitted from the ministrations of Dan Smith and reflects great credit on his workmanship that includes a new steel floor. 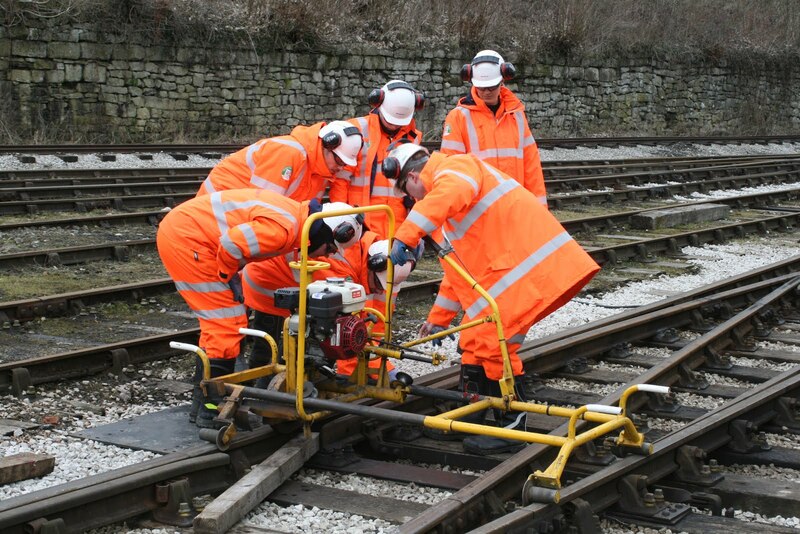 The video is a quick look at today's brake testing of small trailers intended for use by Network Rail in Essex. 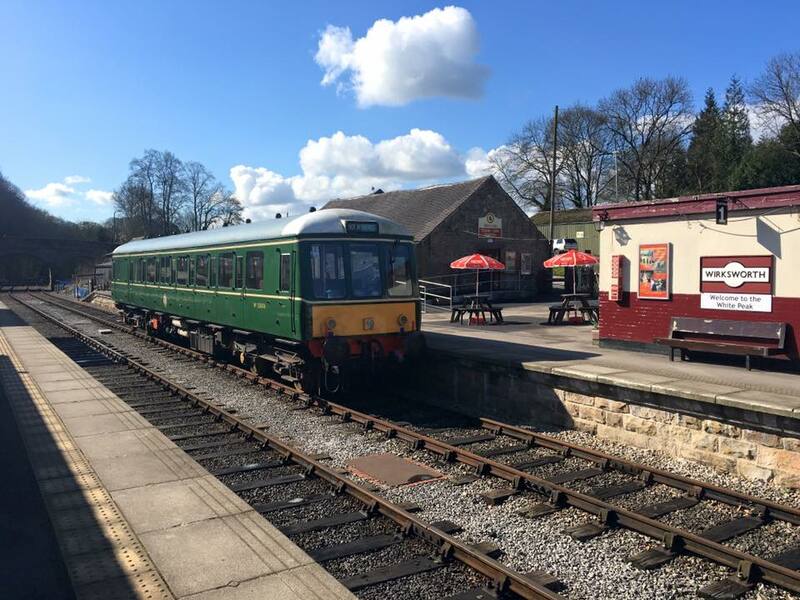 A wonderful day down at the railway today with the sun shining, the birds tweeting and the trains running well loaded for the second day of our Mixed Traction Weekend. Sunday was not expected to be as busy as Saturday but it was still a good day with many people enjoying the sunshine and both D7629 and 33103 in various combinations. Not to mention Dan's excellent big Pullman Breakfast, which were very popular. In fact, the quality of the All Day Breakfast resulted in a possible party booking for many of them! Apart from a little pocket of activity on The Duke, all of the other efforts today were directed at running or enjoying the special event which really has kick started the new season. Many thanks to all who helped in whatever way to put on a successful weekend. A brief look at double headed diesels today in the very welcome sunshine. Day one of our Mixed Traffic Weekend proved to be our most successful yet. Our main line diesel locomotives were certainly a hit with our visitors with consistently packed trains on all Wirksworth to Duffield services. The Pullman Buffett had a very busy day with their new 'All Day Breakfast' menu seeming very popular. As well as catering for the crowds of diesel enthusiast, the team still found the resources to provide afternoon tea to a party of guests. Today's train services were supported by the EVRA Shop, Model and Narrow Gauge railways. Thanks go to all the train crews and operational staff who's professionalism ensured that the day was an unqualified success. Also a special mention to the steam crews who hosted a Footplate Experience before providing a scheduled passenger service to Ravenstor. Due to the sheer number of visitors the crew had to provide many additional services and my personal thanks to them for their dedication and hard work. Finally, some warmth! 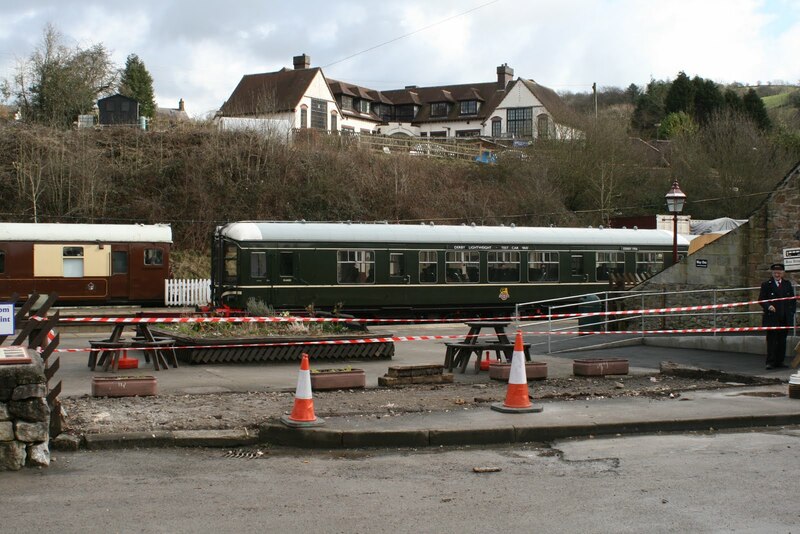 This brought about a frenzy of activity, particularly in the station area at Wirksworth, as we prepare for our first event of the season this weekend. Some signage was moved around first of all, followed by an investigation of what is required to repair (sorry, replace) the rotten crossing gate of the Platform 1 foot crossing. Alot of work took place on the replacement door for the Gents because fitting locks and handles all takes time. 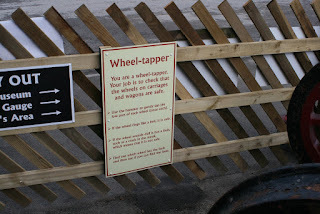 Some welding work took place on the wheel tappers interactive display to ensure they weren't going to avalanche out of position too. A trail Ecclesbourne Breakfast was cooked off in the Pullman ready for tomorrow (you have to have a trial, naturally) as we're doing one off big breakfasts this weekend. We hosted a Drive a DMU Day which was very successful. It also achieved a few things, including shunting at Duffield necessary to facilitate the running round procedures this weekend. 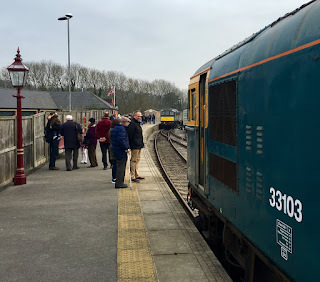 Last thing, the locomotive's were positioned and 33103 received a body wash after the drag on the mainline from Dartmoor to Burton made it a little messy to say the least. As I was driving in this morning I kept thinking that it was all a big dream but on arrival it became apparent that it was very much a reality. There it was, sitting behind the car park gate, 33103 "Swordfish". But I didn't have time to dwell on that because being winched down from a trailer was another new arrival in the form of a lovely Mark 2 TSO. The coach is really nice and has recently had a repaint so is ready to go 'out of the box' and will feature heavily this season, I'm sure. Shunt of the month took place today to make sure that everything is in place for the Mixed Traction Weekend (www.e-v-r.com/mixedtraction) this weekend which included reforming DMU sets for haulage and for next week and the positioning of locomotives. Work took place on the new Booking Office project at Duffield with the majority of the base area dug out ready for construction. 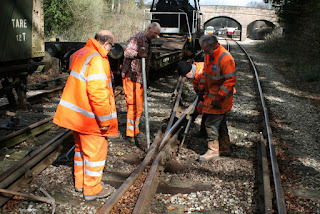 Also down the line, the S&T guys were working at Idridgehay in their quest to hang the newly constructed crossing gates. A delightful new arrival today at Wirksworth - TSO (Tourist Second Open) 5145 built at Derby in 1966 with 64 seats at tables and capable of being heated by steam or electricity. A most useful addition to our fleet which make on train catering a delightful experience. Many thanks go to Derek Mason for making this aquisition possible. A video is also attached on the very early days of the Tramway Museum. A disc was left for me at Wirksworth Station some time ago by an unknown person, step forward if it was you!, and I have managed to convert it to a Youtube video. Scenes include John Bull, the Beyer Peacock steam tram that ended its days as Gorton Works shunter but made a fleeting visit to Australia in its early days. Unfortunately it is now stuffed and mounted in the Exhibition Hall at Crich. The red head seen very briefly on the diesel, Rupert, was me! - happy days. 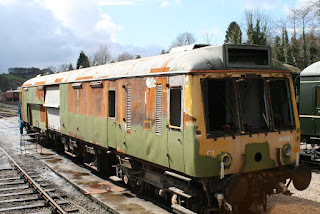 The lone DMU member commenced an A exam on the Class 119.
unit failed and is awaiting spares. Could be a long night !! 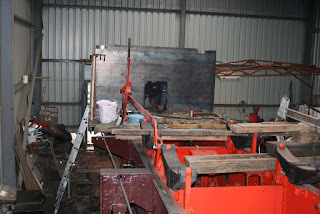 Two photos one of which shows the grinding trainees and the other the new coal bunker that has be fixed to Cathryn. I am a former law firm Partner and my legal services business, Contracts 4 Commerce, provides companies with their commercial contracts for a low fixed fee. I am writing to inform you that we have produced new Terms and Conditions which have been specifically developed for use by businesses in your market sector. Once adapted by us to suit the needs of your Company, our Terms and Conditions will provide comprehensive coverage for all of your business activities. Many happy people travelled along the valley today for Mother's Day and some indeed were booked in to an Afternoon Tea afterwards in the Pullman. Many complementary comments were made regarding the catering department who are becoming quite proficient at delivering to a high standard. The DMU team pottered about down the yard, whereas Fred and Iris pottered around preparing the station garden for spring (photo attached). We have our Mixed Traction Weekend next weekend featuring the first passenger runs of D7629 here at the railway along with 33103. There will also be steam on the Ravenstor line to kick off the Ravenstor running season. See you there? It was a a pleasant sunny day with scattered showers here at Derbyshire's favourite branch line. We played host to a steady steam of visitors who braved the cold weather to enjoy the early spring vistas along the Ecclesbourne valley. Talking about vistas following a little experiment in railway feng shui by the commercial department the wheel tapping exhibit has found a new home. (photo attached). It is hoped the new energy flow will help drive footfall into the booking office to purchase lots of gifts and souvenirs! Down the yard the LMSCA continued the restoration of the BSK and Tim Oakes et al worked on the Duke's frames. The DMU fitters were in multi-tasking mode successfully rectifying a lighting problem with the soft drinks fridge in the booking office before tackling a more complex electrical problem with Iris's batteries. Supporting today's train service were the EVRA shop and Pullman Buffet. Thanks go to the train crew of Richard, John and Peter who ensured our Duffield service ran to schedule and our passengers were well looked after. 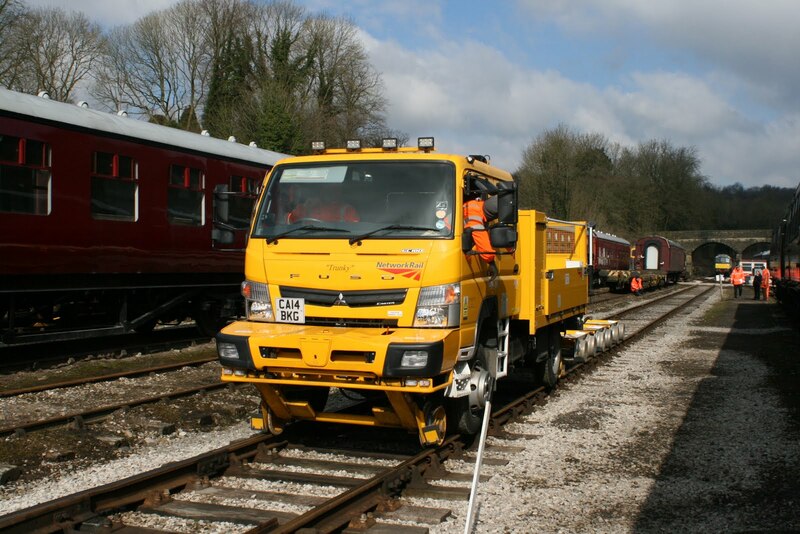 Yesterday, whilst some of the PW continued with the repairs to the track, some of the team were at Duffield assisting with the project to put up the new Booking Office at Duffield. I am really excited about the progress there in just a few days although I gather that the concrete base which used to have a mobile phone mast on it was some of the hardest concrete known to man. The introduction of a new facility at Duffield really will make a great difference to our enterprise. Incidentally, the EVRA secretary reported today that they are about £2,000 short of their full target needed for the materials for the project so if anybody would like to contribute, however small, then get in touch! The DMU team shunted the yard so that everything was back in it's rightful place after vehicles were moved out of the way for the movement of the old Booking Office. One may wonder why the vehicles around the Maintenance Facility have anything to do with the old Booking Office cabin but it's because it has gone for reuse as a warm empty space. Very useful for leaving panels of wood to dry when they've been varnished or painted. It'll want some repair work first but at least it's in position. This morning the WyvernRail board met in the basement of Wyvern Towers. Someone once said that the jacuzzi was on the 54th floor and there was a revolving restaurant ran by the Catering Department on the top floor… Actually, Wyvern Towers doesn't exist and the meeting was actually held in the Pullman. This afternoon we ran a Double Gloucester Experience for a few people in the snow. 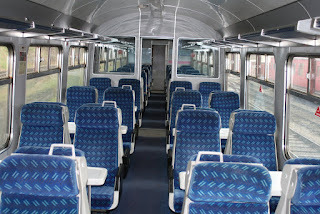 No, this isn't a cheese tasting experience, it is actually a DMU driving experience featuring two vehicles built at Gloucester Railway Carriage and Wagon works. Not sure there's many railways that can run a double Gloucester DMU, especially one of different classes! It is important to say that whilst all of the expansion going on at the moment is quite remarkable, it does leave us quite short of volunteers in some areas. In particular the Wirksworth Booking Office is very short at the moment so if we can tempt you with a lovely new office which has climate control (well thermostatic heating anyway) then let us know. Also short is the position of Third Man which is primarily doing the gates and checking tickets. This is quite an active role but does open up opportunities to becoming Guard and potentially even a Driver, so it's definitely the start for budding operational staff. There's always a need for people in any area so any help is appreciated. We have a dedicated Volunteer Liaison Officer called John Ball who can help you through the induction process and with any training you need provided, there's no previous experience needed! It was remiss of me to not mention the PWT who have been sleeper changing between Hazelwood and Duffield during a quite inclement day and in between trains. The bogies shown have been purchased from the Derby Lightweight Group after years of inactivity at Butterley. Firstly an apology if you get two of these, if you don't the apology is withdrawn. The first day of March saw a piece of history consigned to a new location. The former Booking Hall, that was second hand when we bought it, moved after many years of faithful service revealing a new vista that will show our wares to the intending visitors to very good effect. 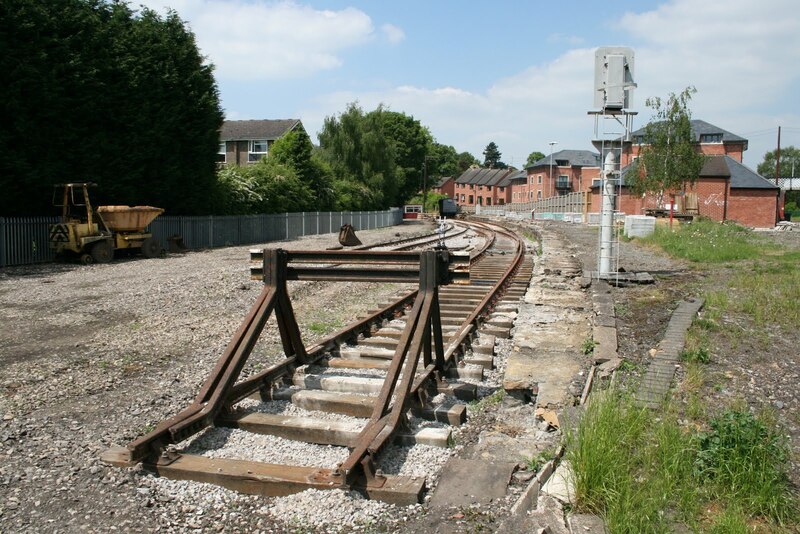 The area exposed will be surfaced and the VCT will work their magic on the creation of Midland Railway style fencing to add an appropriate finish. Today's service with railcar "Iris" was quiet but washed its face financially with the train crew supported by the Booking Halls at Wirksworth and Duffield together with the Pullman Buffet and Model Railway. 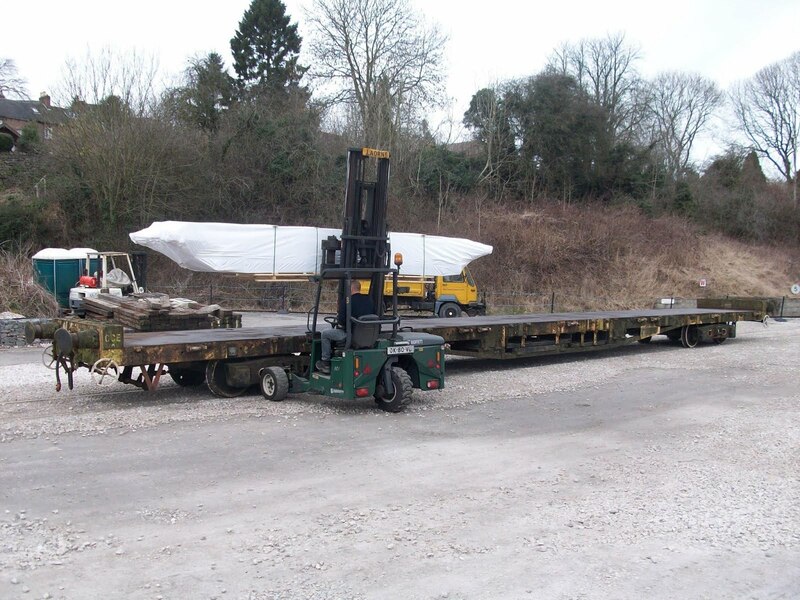 The second of two accommodation bogies arrived for the LMSCA which will allow their Mark 1 SK to be temporarily placed upon them while the Commonweath bogies presently underneath the vehicle are refurbished. The DST reported that Henry Ellison had been reassembled ready for the 2016 season and boiler inspection next week and the LMSCA tended to their BTO in between assisting the Booking Hall move. Fred and Iris made the Mess Hall at fit place again but it is akin to the fabled Forth Bridge repainting project.